"On a bright Saturday in early spring, Detective Gemma Monroe responds to a missing person call at Lost Lake, near the small town of Cedar Valley, Colorado. With its sapphire waters and abundance of wildflowers, the lake is a popular camping destination in the summer. But for now, ice still grips the lake and snow buries the flowers. When Gemma arrives at the shore, she meets three friends who have been camping there: the fourth of their group, Sari Chesney, has disappeared in the night without a trace. Sari is an assistant curator at the local museum, which is set to host a gala that night--a project she's worked on for months and would never intentionally miss. As Gemma begins to understand the complex dynamics of the supposedly close-knit friendship group, she realizes that more than one person is lying to her--and that the beautiful, still waters of Lost Lake may hide more terrible secrets . . ."
Lost Lake was another really great addition to what has fast become one of my favorite mystery series. There is only three books in this series so far (counting this one) but they have all been at least four star reads for me which really says a lot in my opinion! There is something about the way that this author writes that I just can't get enough of. The descriptions that she includes within the pages of these books is both beautiful and haunting. I found myself re-reading sentences just so that I could savor the writing and this author's way with words. I think describing the way she writes as lyrical would be another good description if I'm being honest. 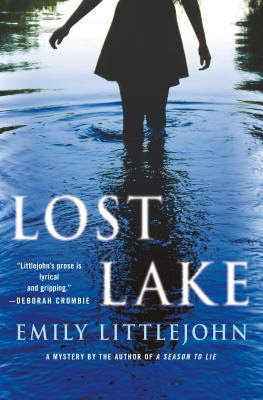 In this book, the descriptions around Lost Lake were both evocative and chilling. I could just picture everything that she was describing so clearly in my head - I was just as creeped out by the lake as Gemma was in the book! I really cannot say enough good things about the writing in these books! I also always enjoy the mysteries in these books and this was no exception. I loved how in this book there were three separate mysteries or cases that Gemma was investigating that all possibly tied together. I spent the entirety of the book trying to figure out if the three cases did actually tie together or if it was all coincidence and completely separate. Honestly I really just lost myself in the pages of this book even as I tried to take my time and savor it. It's a long wait for each book when you love a series so much so I wasn't ready to finish this one right away. I obviously can't say enough good things about this book. I did guess part of the ending but not the why's behind it all which kept up the suspense until the very end. I'm left very excited to continue on with this series! Now begins the wait for book four! Overall, I really enjoyed my time with this book (and this series to be honest) immensely. These books have all been so good that I almost can't put into words how much I have enjoyed them. Just the writing and this author's way with words set this series apart from so many of the mystery series out there. I don't think that you have to read them in order necessarily but I would recommend it. There are pieces from that first book that still carry into this one so I think that you will enjoy these books that much more by reading all of them. I can highly recommend this book and this series as a whole! Each book has been suspenseful and hard to set down. Highly recommended! Bottom Line: A gorgeously written mystery that I savored the entire time! Disclosure: I read this book courtesy of my local library system. I'm definitely going to begin this series this year. Love the setting of Colorado. Do you know what part of Colorado the little town is supposed to be? Just curious. We're going to Colorado Springs later this year - my husband has a work conference and I'm tagging along. It's been a while since we've been up there. Kay, I can’t remember the name of the city offhand unfortunately. Colorado is beautiful so I’m sure you guys will have a wonderful trip! My husband and I wouldn’t mind moving there one day!! I really need to try this series! It sounds so good and I love that it seems like it's only getting stronger as it goes along. Katherine, it is really good and I just don’t hear much about it which is unfortunate. I hope you get the chance to read and enjoy these soon! This does sound like a wonderful mystery series. Terrific review!